On 21 August 1860, the British army was assaulting the heavily defended North Taku Fort and were being held up by the defenders. The British Artillery managed to open a small aperture in the wall large enough for a single file of men to pass though. Lt Rogers and Private McDougall of the 44th East Essex together with Lieutenant Edmund Henry Lennon of the 67th Regiment swum the ditch surrounding the fort and entered by one of the apertures during the assault, and were the first of the British established on the walls. They passed through in the order listed above, each assisting the other to mount the embrasure by sticking their bayonets into the wall. Lt Rogers was severely injured by a musket ball on entering the fort but continued to fight until reinforcements arrived on the wall. 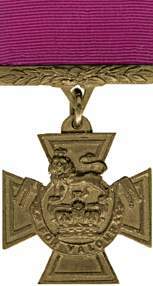 The VC was presented to Private McDougall by Brigadier Adams on 2 October 1862. McDougal's VC is held at the Essex Regiment Museum.